Poor indoor air quality is more than frustrating. It’s a serious problem that can cause issues ranging from mild eye irritation, to an itchy nose and sore throat, to persistent headaches and fatigue. The prolonged effects of poor air quality and other pollutants are widely documented to cause more severe health concerns impacting respiratory and cardiovascular systems, as well as cancer. 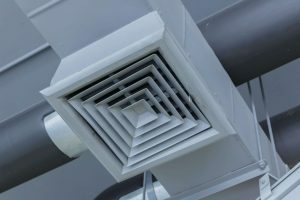 Whether sitting at your desk or processing parts on the plating line, ventilation systems abound throughout the ceilings, walls and floors of the workplace. When maintained and audited on a regular basis, these systems offer both the assurance of clean air, as well as a safe work environment. Poor air quality is often due to the failure or the lack of effectiveness use of your ventilation system. With the aid of cross drafts and poorly placed high velocity supply-air diffusers, vapors can be dispersed from the tank surface and away from exhaust inlets. Inadequate ventilation may fail to capture vapors and mists. We’d welcome the opportunity to review your ventilation requirements and offer clean, cost-effective and quality solutions to increase your safety and productivity.